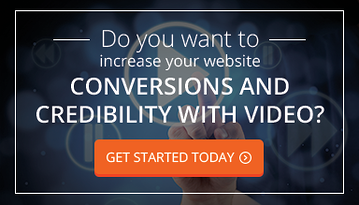 Unbounce reports that including video on a landing page can increase conversion rates by 80%. In a report published by Forrester, video in an email increases click-through rates by 200-300%. According to the Online Publishers Association, 46% of users take some sort of action after viewing a video ad. Forbes has reported that 59% of executives would rather watch a video than read text. As important and exciting as the above statistics are, of equal importance is the impression a potential customer will get when they see that your organization has taken the time to produce this content. Videos are a quick and easy way to establish a level of credibility with your customers. You can test this yourself—check the websites of companies from a product you are considering. Which has taken the time to produce a quality website, with informative and well-produced videos. Which seems more credible to you? Remember, you may know you are a well-established, legitimate and successful company. But, for each visitor, you have to prove that in a short period of time. Video allows you to do that in a matter of seconds. So why haven’t many small to medium-sized businesses hopped on the bandwagon yet? Probably because video content seems complex and expensive to produce. However, producing informative, short videos should not be viewed as a complex or expensive problem but a fun and exciting new initiative. As long as you spend the time properly devising what type of video you want to produce. At NP Group, we recommend producing concise video content for a variety of different topics. First, you should work to produce a 30 to 60-second video that serves as a company or product overview. This video should describe the problem, introduce your solution by making a claim and lead to a follow-up activity, all within a short period of time. The best place for a video like this is on a homepage or a landing page. After production of the initial introductory video, think about topics that require more explanation—topics that typically you would discuss in person or via a telephone conversation with a prospect. For example, we have produced an interactive video that summarizes our web development process. This would normally be something described to a prospect on a phone call. Now, video makes it easy to relate this complex topic in a quick and credible way. Video is an acquired skill set that requires proper design, videography, and production. But, anyone can start the process of writing the content for their video themselves. Typically, it begins with a script. At NP Group, we work with clients to produce a script, or at the minimum an outline that will lay out the content strategy of the video. It’s important during this step to make sure your video matches your overall marketing strategy. Like any other produced piece of content, is it targeted at a specific type of visitor or persona? Does the video focus on a particular stage of the buyer’s journey or the sales process? Don’t lose sight of the whole when engaged in the production of a video, even if it’s a quick introductory video. From there, our team designs a storyboard to summarize the graphical direction of the video. Video can be produced in a variety of ways: animated videos are designed graphically and talking head videos require videography. The storyboard will represent what type of video content will be utilized during production. After the presentation of the storyboard and any additional design revisions, the production of the video can begin. When the production is completed, think carefully about where and how to present the content. Introductory videos work great on homepages and landing pages. More in-depth topics should be introduced in the appropriate sections of your website. Don’t forget that video content should be submitted to social media channels as well! Many businesses work to produce exquisite video content and just post it on their Web page. Remember also that social channels such as Facebook, Twitter, YouTube, Pinterest are essential as well. It’s important to include video analytics in your marketing reports. Stats for videos are much like web access statistics. However, also pay attention to completion rates. Do users watch the entire video or drop off after 25% progress? Utilizing integrated video hosting tools such as Wistia or Vimeo can answer many of these questions and help guide you towards smarter business and content decisions down the road. In conclusion, remember the point earlier in this post: you trust your brand, but your customer doesn’t… Yet! Creating credible, high-quality content establishes your organization as a credible source of information and services. Today’s B2B and B2C shoppers are expecting this level of careful consideration, and not engaging in areas like video will surely affect your bottom line.